1. Investigate the methods that scientists use to tell the age of things on the Earth. On page 48 in your notebooks make a new unit tab and label it Earth's History. Pick up a checklist for this unit as well and paste it onto your title page. 2. How do scientists study the history of the Earth? 3. What clues can we use to "date" things? Step 1: Take the PreAssessment. Write the answers on page 49 in your notebook. Step 2: Pick up a sheet called "13 ways to tell time backward" and watch the video "How the Earth was Made" by pushing the button on the right. Read over the article and graphs and fill out the interpretation sheet worksheet. Tape this onto page 50 and get it checked before moving on. 1. Investigate a specific phenomena that occurred throughout the Earth's History. 2. 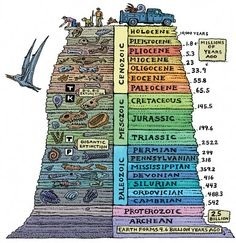 Identify the Era in which it occurred on the Geologic Time Scale and then research that Era to find out other important facts. 1. List and describe 3 techniques that scientists use to date things on the Earth. Step 1: Watch the videos to the left and below. Step 2: You will be assigned a "major event" in the Earth's History and use the Student Roles in Geologic Time table paper to follow the directions for the activity. Ask your teacher to issue you a "major event". Paste your event slip onto page 51 and use the rest of this page to write down your research notes. Use the Prehistoric time line button below to help you with your research. If you do not finish your research and your drawing, it will be homework. Your drawing should be on a construction sheet of paper and titled with your event. Step 3: Time maps should be completed using your directions in the major event assignment and pasted onto page 52 in your notebooks. 1. Use the laws of relative dating to date rock layers. 1. List the 4 Eras that we have identified in order from oldest to most recent. 2. Which Era lasted the longest? 3. What do you think decides the end of one era and the beginning of another? Step 1: Watch the video to the right and grab a Relative Dating Worksheet Activity 6 to complete. Use the laws to complete the worksheets. If you have problems completing the worksheet, you will need to watch the video in the button linked directly below. Paste onto page 53 in your notebooks. Step 2: Once finished with that assignment in which you date rock layers, we will then add "fossils" to these rock layers to date them. Pick up the Who's on 1st Relative Dating Activity 7 table papers from the portfolios. Read the background information and the directions. You will also need to pick up a set of non-sense syllables and a set of "fossil layers" from the table up front. Complete the activity with a partner on page 54 and 55 of your notebook write down the answers to each question. 1. Analyze & Interpret Data for patterns in the fossil record that document the existence, diversity, extinction and change of life forms throughout the history of life on Earth. 1. In your own words, describe the law of superposition? 2. In your own words, describe the principle of cross-cutting relationships? 3. In your own words, describe the principle of faunal succession? Step 1: Pick up A Geologic Time Scale Webquest and complete using the links on the worksheet or in the buttons below. Step 2: Turn in your webquest and grab a test from your teacher. Complete this test and then move onto the Natural Selection & Adaptations unit.